Sleek, stylish, and made to last, the 2-Piece Herbivore Grinder is an excellent choice for a dry herb grinder for anyone who wants to get the most from their vaporizer by preparing dry herbs properly. 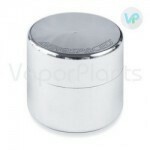 The one- compartment herb grinder is constructed out of aluminum, making it very durable, but also light in weight. To give the dry grinder maximum power for tearing and ripping through herbs, it is outfitted with ultra-sharp stainless steel teeth in a number of different shapes. The 2-Piece Herbivore Grinder is available in four different colors: Black, Blue, Red, and Silver. You can purchase one of these herbal grinders in three sizes: the 48 millimeter small, the 55 millimeter or the 63 millimeter large. Very durable and easy to carry around, light in weight and compact, so it fits in the pocket.